Few people will be thinking about heart disease, diabetes or other chronic “physical” conditions in connection with Mental Health Awareness Month — observed each May — but a variety of studies show they should. Research indicates that the cost of treating chronic conditions doubles when a comorbid mental health condition exists. For example, having a mental illness along with congestive heart failure makes the risk of dying from that heart condition eight times higher. The effect of mental illness on other diseases is similarly alarming: the risk of stroke triples, the risk of hypertension morbidity triples, and the risk of developing type 2 diabetes doubles. Thanks to recent advances in health information technology, people can include a new metric among their vital signs: the M3 score. It’s every bit as important as cholesterol level, blood pressure or heart rate. The M3 score is meant to be a conversation starter between patients and caregivers. “You know your other important health numbers. Now, for the first time, we finally have a number that gauges mental health. By knowing your M3 score and then getting the right treatment, you should have more success managing all your numbers, because mental health affects everything,” said Larry Culpepper, M.D. Family Medicine, Boston University. To get their score, people take the WhatsMyM3screening test for free, either online at WhatsMyM3.com or as an app on mobile devices. The evidence-based mental health screening test was developed by Rockville, Maryland-based M3 Information LLC. 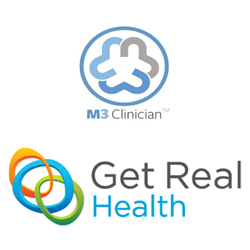 A version called M3 Clinician has also been integrated into a powerful personal health platform called InstantPHR®—developed by Get Real Health, which is also located in Rockville, MD. InstantPHR is an increasingly popular patient portal choice for hospitals and health systems around the globe. WhatsMyM3 and M3 Clinician offer both healthcare consumers and providers a new window on mental, emotional and physical wellbeing, facilitating a more holistic approach to healthcare. The tools enable people to securely share their M3 score with their healthcare provider — making screening for mood and anxiety disorders easy, quick and private. “This new functionality available within InstantPHR is great news not only for providers and patients, but also for the healthcare system more broadly, because managing mental illness reduces the cost of treating other chronic diseases,” said Robin Wiener, Get Real Health president and founding partner. M3 Information is a Rockville, Maryland, based company creating health information technology solutions to improve the lives of people with mental health and substance use conditions. M3 Clinician, the company’s most popular product, is NCQA approved and uses secure mobile health and web-based technologies to deliver behavioral health risk assessments and progress tracking information to clinicians. The company also developed WhatsMyM3, a mobile app and whatsmym3.com, an Internet-based risk screen for home use. Health care providers rely on M3Clinician.com, a browser-based portal and mobile app. For more information on M3 please visit:http://www.youtube.com/watch?v=-ex7syaOELk. Founded in 2001 and headquartered in Rockville, Maryland, Get Real Health is an award-winning global health information technology pioneer specializing in patient engagement and connected care solutions. Get Real Health’s flagship product — InstantPHR®—— is an electronic toolbox for creating and customizing personal health applications. In addition to the InstantPHR platform, Get Real Health offers turn-key solutions and custom services for a wide range of healthcare organizations. Get Real Health has a diverse global customer base and strategic partnerships with industry leaders including Microsoft, Caradigm, and TELUS Health Solutions. Visit: http://getrealhealth.com//.